If you ever want to meet your neighbors, get a dog. In fact, if you ever want a "quiet" dog walk, you probably won't ever get one. Around here we have what we call, informally, the Dog Walk Hour. I'm sure that if you're in an urban or suburban environment, you'll see it too. Come home, and you're greeted by family. Two footed and Four. In my case, there's feathered as well. Hellos are interspersed with squawks, jumping paws, and people greeting you since you have been gone forever. Get done the absolute minimum, maybe have a perimeter search around the house, and then you're getting ready to go off again. Leash in hand, a fist full of bags in your pocket, check for keys and phone, and you're on your way. So is everyone else with a dog. 5:30PM to about 6:30 is the peak. I have a mile course I do three times a day and it should take me about 15 minutes. 20 if Rack is constipated or if there is a delivery at one of the businesses on Wilton Drive. He doesn't like those big diesel trucks. We're out the door and round the corner. Rack is already furiously wagging his tail. I spot one of his friends, a big, older husky named Cody and a little maltese that is incredibly well mannered, both way down the block. Small dogs are still dogs. If your dog is barking at a leaf falling in the next county, you're training it wrong. No matter the breed, they can be trained. I run into Cody's owner finally and we're chatting about things. It's our Secret Season here. Too late for most Snowbirds, the weather hasn't changed over to hot yet, and there is low humidity since the wet season hasn't yet set up. The Tail End of March into April, as well as Late October or Early November. Both great times to visit. I casually mention the flowers and the conversation segues immediately into Cody's mom's neighbor. Seems that that person had orchids all over the property. The property is a condo at Belle Isle. There's a quirk of geography that makes it where people walking into Wilton Manors from Fort Lauderdale want to go to catch the dreaded 50 bus that Rack can't stand the noise from. She had said that up until recently that person had orchids all over. Had. They were strapped to trees and lovingly cared for and at this time of year that means they were in bloom. I have four in bloom myself as well as a wall of magenta bougainvillia, purple ruellia, and other beauties in my own backyard. She told me that was why I still have them. The property in question was off NE Ninth Avenue, and someone came by "at two in the morning" and helped themselves to them. 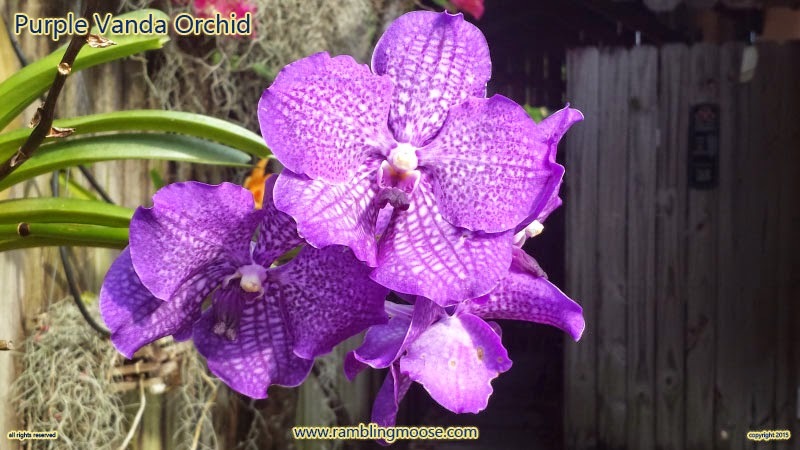 Orchids generally take a year to bloom. I have had one bloom twice in a season, but normally they will rest once the weather changes until they're happy again. Pictures are taken to enjoy them while they are here for that reason. I responded that I'm getting some input that I should plant my Mango tree in the front yard, but that's just another reason not to. "Not if you want some fruit you won't. You'll never see it.". That settled that particular thought. It's going in the backyard as soon as I can get around to it, and far enough from the fence so it doesn't "annoy the neighbors". Not everyone likes Mangoes and not everyone likes 2 pound fruit smacking against their property from 20 feet up. So if you want your flowers, listen to Cody's Mom - keep them in the backyard. Behind the fence. Kind of a shame. Like your parents said "that's why we can't have nice things". How I Killed My Computer. Or Not. Lets Go For A Ride! The Best Gambler in the World!